It's 1943 and the Americans and Japanese are fighting a deadly war in the hot, jungle-covered volcanic islands of the South Pacific. The outcome is in doubt, and now a terrible blow has fallen on American morale. Lieutenant David Armistead, a Marine Corps hero and cousin of the president of the United States, is missing and some say he's gone over to the enemy. All that's known for certain is he was last seen heading north into Japanese-held islands, taking with him the beautiful, young native wife of a colonist who heads up the local militia and is swearing revenge. Something must be done before Allied unity falls apart. Coast Guard Captain Josh Thurlow and his ragtag crew are given the assignment to find Armistead, though not necessarily to bring him back alive. Recruited in the hunt is a tormented and frail PT-boat skipper nicknamed Shaffy, who's also known by another name: John F Kennedy. When Josh is stranded in the jungles of New Georgia with a mysterious, sensual woman who has a tendency to chop off men's heads, it's up to Kennedy to come to the rescue and complete the mission. To procure a gunboat, however, he first has to play high-stakes poker with a young naval supply officer called Nick, who happens to be the best gambler in the South Pacific. Nick has another name, too: Richard M. Nixon. The adventures of these hot-blooded characters wind tighter and tighter until a fiery, climatic day when Joe Gimmee, a local holy man with some peculiar ideas on how to acquire treasure from the gods, has promised a miracle. The one he produces is remarkable, and will change the lives of everyone who watches it unfold. 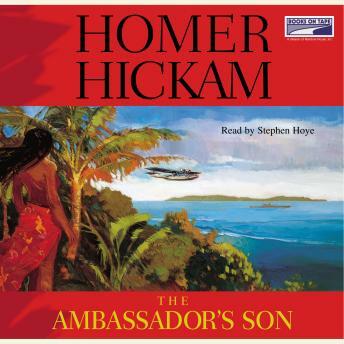 Based solidly on historical facts with echoes of James A. Michener, The Ambassador's Son is a thrilling tale of the South Pacific and adventure fiction at its finest.